October, 2006What?? I have to wear this pumpkin suit and i'm too little for candy?! So cute, you're little Pumpkin! Now THAT is a happy pumpkin. Oh no! My boys are going to be pumpkins this year, hope we don't have the same reaction! oh how sweet, so adorable! Lol! All the work and none of the reward! That's such a cute/sad picture. I felt bad making my kid dress up last year since he too was too little for candy! OMG - that face says it all! Too cute! Awwww! Look at the poor sweet little pumpkin! Poor baby -- Halloween is so cruel. Oh my Gosh. Usually babies change so much that their baby pictures look nothing like their current selves. Not so for that little pumpkin. She looks exactly the same! And cute as can be - unhappy or not! ..."I don't wanna be a pumpkin"...so cute! thats hilarious....i let charlotte have her first piece about 10 months old. im terrible. That is hilarious! How adorable! And I have toagree with the no candy B & M.
Why are all the fussy kid pictures the most hilarious? I burst out laughing when I saw your pic! Poor K! But thanks for the great laugh little girl!!! If you go to Daily Blonde's new blog (Maverick Fish or something)- she has a fish that she is running for president and was looking for a vp and I suggested BG- I think Sue went out of town. 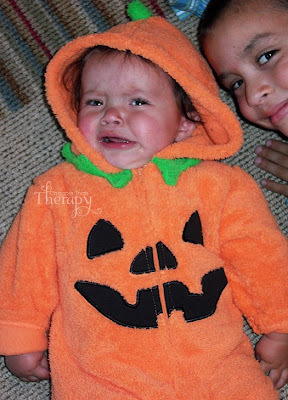 Aww someone didn't like the little pumpkin suit. So adorable!! awww!!! How sweet is that picture! I love DQ peeking in on the side! D was a pumpkin his first Halloween too, although he was only 2 months old!!! She looks the same now as she did than!! Ok that was beyond adorable! possibly the cutest picture ever. SHe looks exactly the same still! Cutest pumpkin ever. And that face? Ha ha - priceless!!! Adorable! I loved it when I kids were that age and I got to pick out their costumes. That sure didn't last long. Sassy had the same kind of costume, but a duck her 1st year. The pumpkin's cuter! Aw, how cute! Poor kid, why do we do this to them? Tag, you're it! Hope you'll play. Rules are on my blog. How can something that upset be so stinkin ADORABLE?????? o.mg. I just came browsing over here from happy hour blog and I saw this. I *thought* I had made this up in my blog...lol. 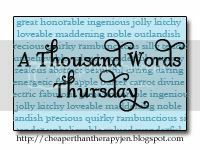 I have somethign so similar, it's called thousand word thursday and I let my blogees caption the picture for me. Too funny. Oh well, hi!